A lot focus in recent years has been on the labor force participation rate — the share of adults either with a job or looking for one — and with good reason. It provides a good estimate of how many individuals are engaged with the labor market and potentially looking at the productive capacity of the economy. With that being said, aging and shifting demographics have a massive impact on the LFPR. As such, it is also important to look the share of individuals that actually have a job. At the end of the day what matters, and what feels good for people is money in their pocket or bank account. The first graph shows the share of Americans that have a job at each individual age for 2015*. Employment rates are highest, and pretty stable from one’s mid-20s through their mid-50s. This is the reason 25-54 years old is considered the prime working age population. From there, employment and labor force participation rates decline considerably as one ages. 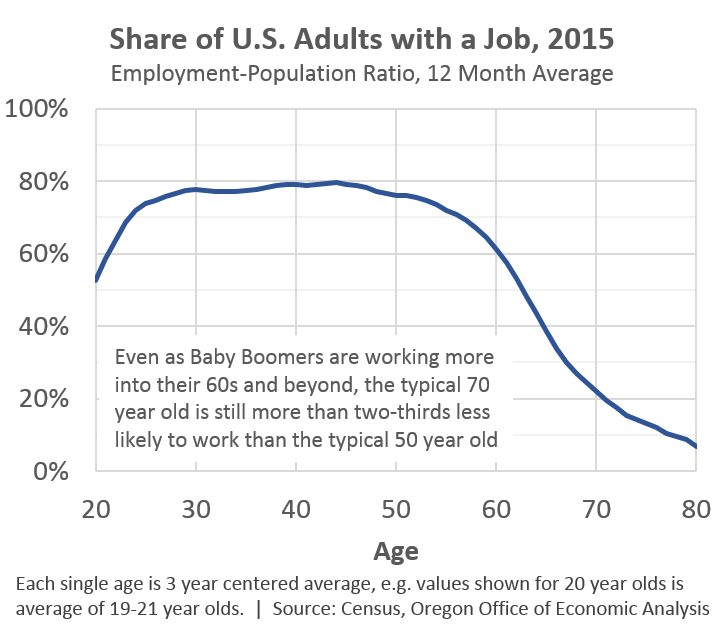 As the graph notes, the typical 70 year old is more than two-thirds less likely to be employed than the typical 50 year old. The shape of the graph above is typical no matter what year you look at. What matters are specific differences between years in terms of their economic impacts. The second graph shows such differences for 2015 relative to the past two business cycle peaks in 2000 and 2007. Many economists use the prime working age EPOP as their gauge today given demographic trends, and with good reason. Right now, that measure shows the labor market recovery, in terms of employment rates, is about half-way back to pre-Great Recession rates. What surprised me however was how uniform these changes were for folks in their 20s, 30s and 40s — note the flat line above in this age range. I would have thought there would be more variation among this group. 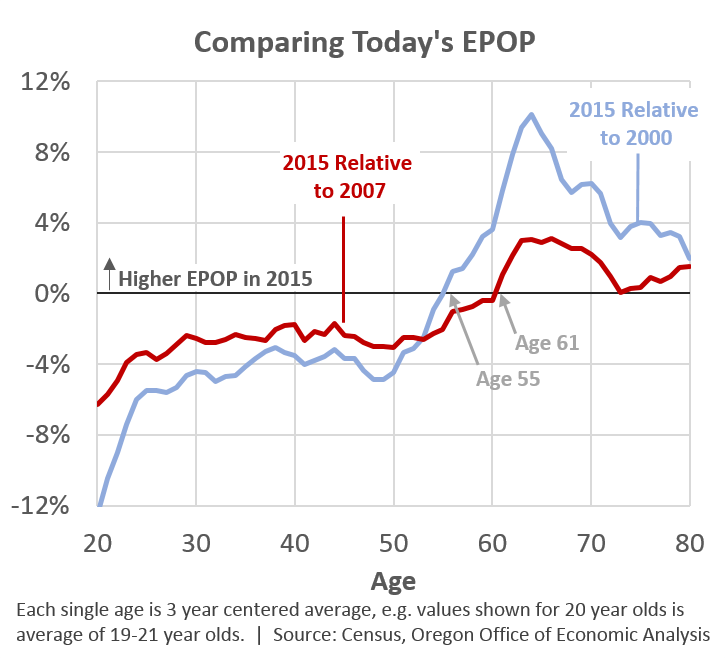 In fact, the Oregon data shows 25-34 year olds all the way back but that may just be sample noise for a small state. What is really striking in the graph are the employment rates for older workers. Here, there is a larger share of Americans with a job today than in recent history. Some of this is due to the changing nature of jobs and better health. Increased office employment allows individuals to work later in life as the physical hardships are much less than manufacturing, construction and the like. However, certainly some of this increased employment among older Americans is financial. Many more are unable to retire due to the lack of financial security, thus they are working later in life. Shifting dmeographics are having a big impact on the economy and labor market. Growth rates are expected to be lower moving forward due to them. As Boomers retire, Millennials are replacing them in the labor market, however for each retirement you need to hire more than one person to see positive growth rates. The latest BLS projections indicate 9.8 million more jobs in 2024 than in 2014. However BLS shows 46.5 million job openings during this time, primarily due to this labor market and generational churn. In talks and presentations, I tend to tell people that even with lower growth rates we will have plenty of jobs in the near future, as many of the jobs will be this generational churn below the surface.